I know I'm a day late but I am a dog and reading the calendar correctly isn't my best trick. We hope everyone had a wonderful Thanksgiving. Mom & Grandma went to a relative's house for Thanksgiving and didn't even bring me back any turkey. The nerve of them. I though Grandma would've slip me some at work today but she didn't. 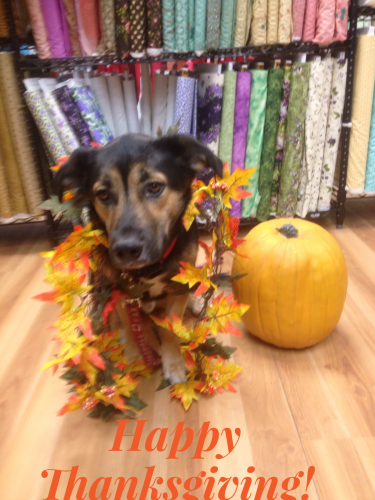 For an added insult, this is the photo Mom took and sent out to everyone as her Thanksgiving Facebook card. I was not happy and had to be bribed heavily with dog treats. Well, on a different bone, here is what's happening around the Shop for this weekend! 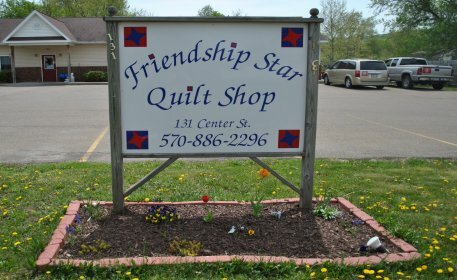 For our quilting friends who can stop in, Saturday is Small Business Saturday. To celebrate, we are having 25% Off Christmas and there may be a surprise sales item or two on Saturday. 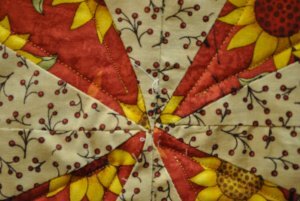 We also are having an UFO Day where you quilters can come in to relax, sew and get a project or two done without interruption before the Holiday Stress begins. There will be treats and drinks available to keep you energized while you sew. I will volunteer to taste test any treats you may need to have taste tested. Mom says "NO CHOCOLATE TASTE TESTING!" Her orders, not mine. If your stuck on a project, bring it in and work on it. Maybe another person may see what's making you stuck. I almost forgot, Finish Your UFO Day will be from 10a-3:30p. Sorry, I got thinking about cookies. December is going to be a busy month. We have lots going on! Fabric Challenge Projects are due by Monday, December 7th. Customer voting will be from December 8-14. Come in and check out & vote for your favorite FCP! Our winners are chosen by popular vote. We should have several FCP's coming in! We are very excited about how many folks signed up this time around! The competition should be pretty stiff on this Challenge! their scholarships. There will be approximately 45 vendors in attendance. and Liz. Mom & Denise will be at the Craft Show. 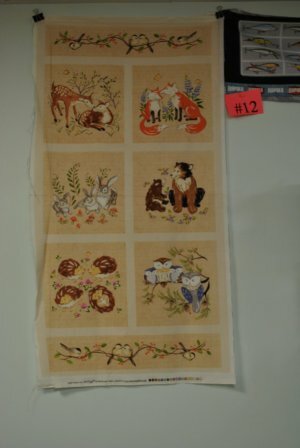 Free Demo & Pattern Day 10a-11a. More treats and coffee or tea. Again, I offer my services as a taste tester this day. 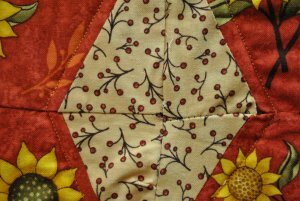 November's FD&PD, bring in a finished project from that demo for a door prize. You may want to stop in and get a ticket beforehand. This class may fill up fast! We are limited to 12 people to have seats. Everyone after that has to stand. Since the following weekend is Christmas. We tentatively have a lesson on making a Christmas Bag. If you need a gift bag, come in and Grandma will show you how to whip one up. 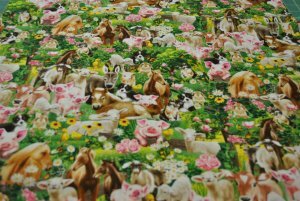 Bring your own 1/2 yard of fabric or pick some up here. It's a free lesson. We will be closing at 12 Noon on Christmas Eve and will closed until January 4, 2016 for Inventory. Our Show and Tell for December! 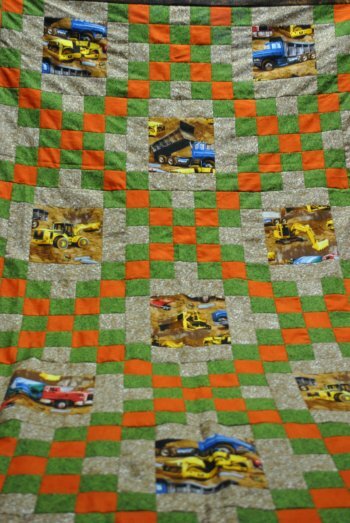 This quilt is made by Heather C. for her son. 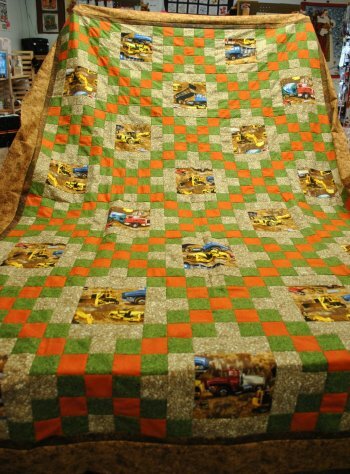 She will be using 2 of the Tonka Playmat panels we have in stock to put in the middle of the quilt so he can play with his cars on it when he's not sleeping under it. 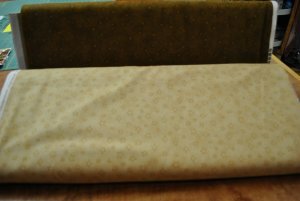 Keep your stitches straight and may Santa bring you lots of fabric, thread, cutters, rulers and gift certificates for Christmas!